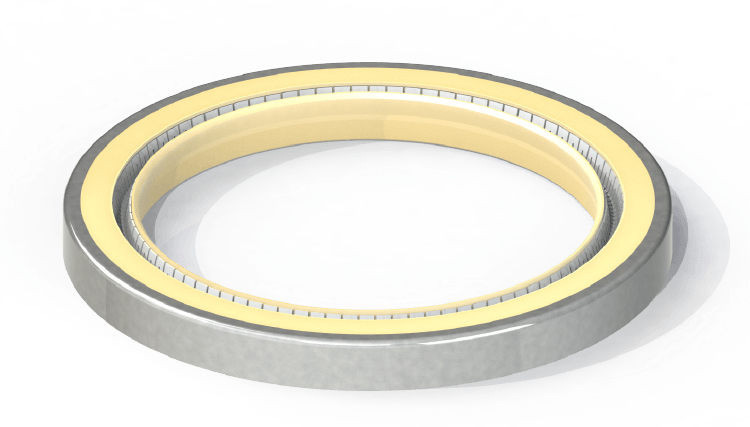 Cased Spring Seal - Eclipse Engineering, Inc.
Cased Spring Seals are the best option for extreme rotary service. In these designs, a metal case is constructed around the outside of a spring seal, which in turn gets press-fit into the hardware bore. A metal-to-metal press-fit ensures a tight seal as well as a highly effective anti-rotation mechanism. Because these seals are installed into open bores, they lend themselves to rotary applications such as gearboxes and power transmission systems. They can also be utilized as rod end scrapers, where exclusion of aggressive media is desired. Our product modules offer an in-depth step-by-step guide to help make choosing and ordering the right product for your project easy. Introduction to the product and a typical range of applications including temperature, pressure, velocity and media. Detailed ordering examples and product illustrations. Chart of standard seal materials including eclipse material code, description, color and applications. Chart of standard part numbers including part number, rod Ø, groove Ø, groove width and o-ring dash size. Hardware details including a cross section series, min rod ø for solid gland installation, r radius (max) and c lead-in chamfer (min). We offer custom solutions to a wide variety of seal needs that span various industries, from aerospace to automotive to mountain bike design. Eclipse was the first supplier to offer a full range of materials that meet the latest SAE spec AMS3678, which requires a high degree of testing and certification to meet the needs of our most discriminating customers. We understand your time is valuable. That’s why we work to get your product designed and delivered fast, eliminating downtime and saving you money. We stay ahead of the game with the best prices for the best quality of product in the industry. Eclipse was founded under the premise that if we could solve enough of our customers’ problems they would continue to come back to us for solutions regardless of the type of products we offered. Eclipse has evolved to produce standard product o-rings for a wide range of industries including Hydraulics, Pneumatics, Energy Production, Aerospace as well as Pharmaceutical and Food Handling. Instituting ISO9001/AS9100 quality system in 2015 allowed Eclipse to become a top tier supplier. Today, Eclipse can support our smaller customers that require only a few seals a year to those needing in the 100’s of thousands. We continue to retain a quality product and are able to deliver consistently on time. Our customers continue to bring us challenging projects that allow our team to do what we do best, problem solving. "We started Eclipse with the premise that if we could solve enough of our customers problems they would continue to come back to us for solutions regardless of the type of products we offered." In need of Seal Rings? Click below to view product modules or request more information.